Thank you, Orange Credit Union! Your generosity has helped the Orange Shelter make essential renovations needed to continue our work in the Orange/Bathurst region. With your help, we can provide care, housing and veterinary treatment to abused, injured, neglected and sick animals. Built more than 30 years ago, the unpolished concrete flooring of the Orange Shelter cattery (initially installed in the early 1980s!) needed a critical upgrade. The concrete flooring didn’t allow for efficient or effective cleaning due to its porous nature. 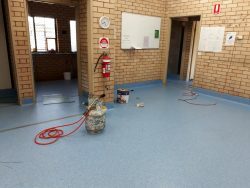 A variety of bio-fluids were at risk of soaking into the unsealed concrete, risking overall shelter biosecurity and the transmission of zoonotic diseases. 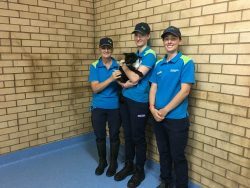 We made a plan to make a series of renovations: cover the existing concrete with sealed vinyl, such as that used in veterinary clinics, to bring the cattery up to current standards and improve efficiency, safety and disease control. Put your paws together for Orange Credit Union for their generous suppawt!